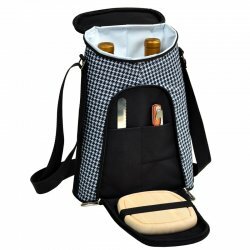 PIC 398-HT, The insulated Houndstooth Two Bottle Wine & Cheese wine bottle carrier is beautifully designed with interior leak proof lining. Wine tote is made of 600D Polycanvas. NOTE: Canvas wine carrier comes in a Houndstooth pattern.